But Charlie Kane appears to have been more… liquid… than latter-day flimflammers. A Brighter Summer Day, the late Edward Yang’s four-hour 1991 masterpiece, set in Taiwan around 1959 or 1960, is a coming-of-age film, a love story or three or four or five. It is also a true-crime tale, a wondrous gift in so many ways. Its multitude of astonishments include a sure, novelistic mastery of accruing details in an expansive shape that is built upon observation of the smallest moments, gestures, blood-boiling fixations, fetish objects, mortal desires, moral frustrations. Yang’s extended takes, mostly from a fixed position, are an elemental building block of the devastating play of emotions. (As the story progresses, the camera tracks or dollies in quiet, assured ways at key moments.) The cast of largely teen characters, played mostly by nonprofessionals, divide themselves into gangs and do battle in a country struggling still for its own identity against both the recent history of China and the political strictures of Taiwan and the confections of the West. (The title comes from the lyric to “Are You Lonesome Tonight” as sung by Elvis Presley as well as one of the characters.) Politics and movies and fathers and sons and mothers and daughters and first love and scorching, insensate first jealousy are leavened by rock ‘n’ roll interludes and a middle passage of almost hallucinatory violence that feels like Greek tragedy and Proust and Shakespeare and electric shadows and ecstatic, otherworldly street-brawling that still holds singular bite and tang. We’ve seen all this before, but not a mosaic like this realization, this elusive yet specific fulfillment of narrative urgency, taking advantage of every instant and every inch of its generous, not-a-second-too-long duration. There is calm and there is explosion, there is rest and there is rush. 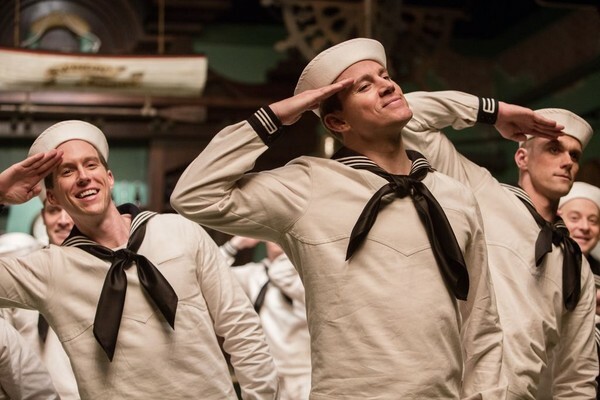 The latest Joel and Ethan Coen joint, Hail, Caesar!, is only superficially a satire of the entitled, juvenile doings behind the scenes at an apocryphal 1950s Hollywood studio, Capitol Pictures, modeled in matters small and large after MGM as well as the Melrose Avenue landscape of Paramount Pictures, and, too, bearing the same name as the studio that was large in the nightmares of one Barton Fink. There are layers upon layers beneath the expectedly detailed surface, which, as Jeet Heer has noted, “Almost all Coen Bros. movies defeat reviewers because films reveal themselves only after being lived with and re-watched.” (Heer’s epic forty-bullet-point tweetstorm on the film is here and worth the soak.) The first level I threw out: Hail, Caesar! is what might have been going on back at the studio while Preston Sturges’ Sullivan’s Travels director was out on the road looking for oh-so-serioso subject matter. The kidnapping of one Baird Whitlock (George Clooney at his Coenesque gooniest) from the set of “Hail, Caesar! A Tale Of The Christ” sets Mannix in motion. Whitlock has been abducted in full Roman garb by a crew of Malibu-meeting Communist screenwriters calling themselves “The Future.” “You’ve got a call from The Future” is one of the least eccentric lines in the spiky, sometimes sparkling script, which includes “It’s not really a dirndl,” Clooney’s character complaining of “300 miles of Frankish road” and an insert card during dailies that reads “Divine Presence To Be Shot.” The daily goings-on at the studio also allow the Coens to dip into scenes that are being confabulated in multiple genres of past eras, including Scarlett Johansson in a choreographed mermaid musical, the sorrows of a singing cowboy and a drawing-room drama cast with inappropriately ungenteel actors. Odd arcana crunches underfoot in most every scene. Tilda Swinton turns up as twin gossips, Thora and Thessaly Thacker, Hedda Hopper and Louella Parsons as if they were born sisters like Dear Abby and Ann Landers, demarcated by swooping, stabbing aerodynamic hats. At a Chinese restaurant much like West Hollywood’s Formosa Café (a couple miles east of the Paramount lot), a scout for Lockheed hopes to summon Mannix into the future, which sounds much like a Thomas Pynchon novel or two to come, where he’d leave the “circus” of the studio’s fixing and human interaction behind for a “ten-year contract.” Historically suggestive proper names clatter without referents: Hogarth, Van Vechten. As par for their course, the Coens appreciate the savory sound of mid-century surnames,.